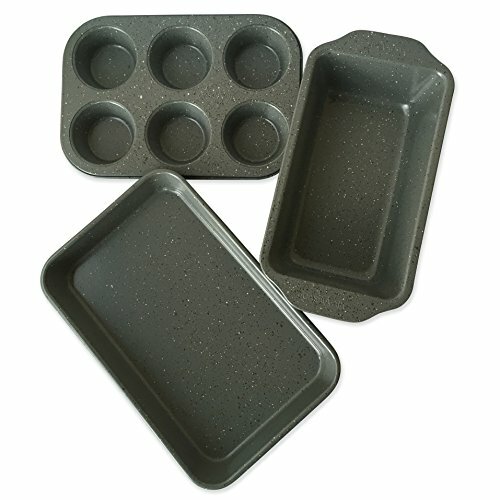 These casaWare Excel Pans are the Perfect size for both toaster ovens and conventional ovens! Heavier weight, Durable 0.6mm Thickness. These pans have two nonstick ceramic coatings that make it both durable and easy to clean. The cream colored ceramic nonstick baking surface is PTFE Free, Cadmium Free, Lead Free, PFOA Free and PFOS Free. The base of the Jelly Roll Pan is fashion colored, high heat resistant nonstick. USE and CARE Instructions: Before First Use- Remove all packaging materials and labels. Wash in warm soapy water. Rinse and dry thoroughly with a soft cloth. UTENSILS - Plastic, rubber, silicone or wooden utensils are recommended. Avoid using any sharp objects or metal utensils because they can scratch any non-stick surface. Always remove food from the pan before slicing or cutting. CLEANING - Cool completely before washing. Hand wash with a soft cloth or sponge and nonabrasive cleansers or liquid dishwashing soap in warm water. Rinse and then dry with a soft towel. Heavier weight, Durable 0.6mm Thichness. Ceramic Non-Stick Technology Provide a Greater Baking Experience. Very Easy to Clean. Just wipe or scrub softly and the food slides off easily. If you have any questions about this product by casaWare, contact us by completing and submitting the form below. If you are looking for a specif part number, please include it with your message.